All this was done by Vidar Holen (mail). Send me questions or comments, especially if you piece together something I have not. 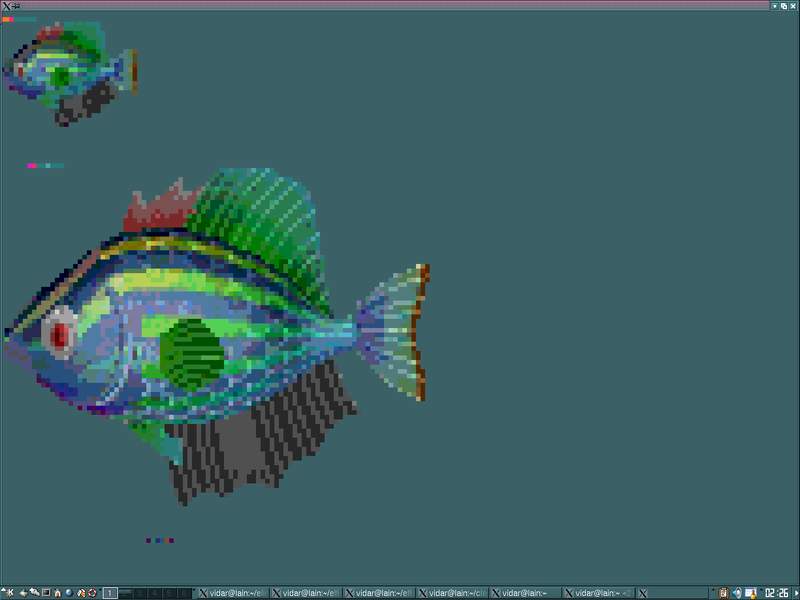 El-Fish, the wonderful fish simulator by Animatek/Maxis, has long been a love of mine. Unfortunately, I haven't actually been able to run the program for years since it's very picky with what it will run on. 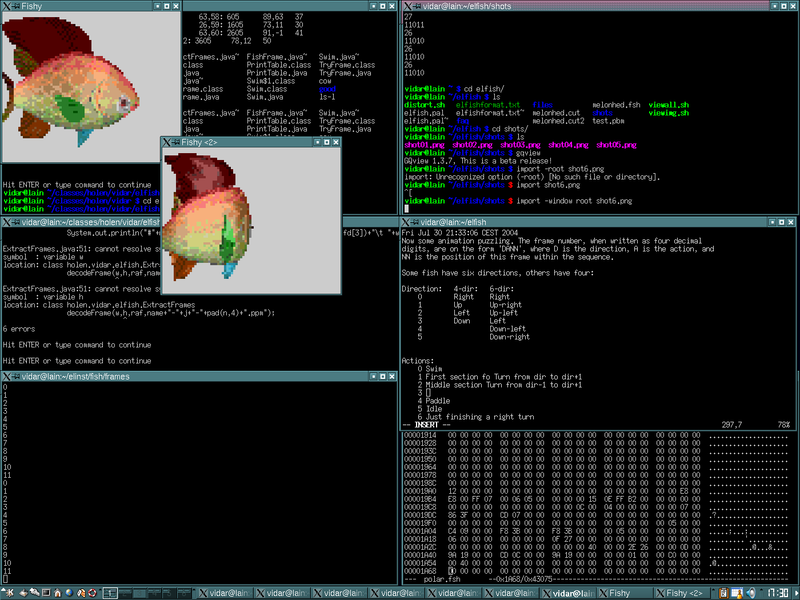 My dream has long been an xscreensaver with elfish fishies, but Maxis turned down my plea to open source it (2002-08-01), so I decided to try to reverse engineer it. 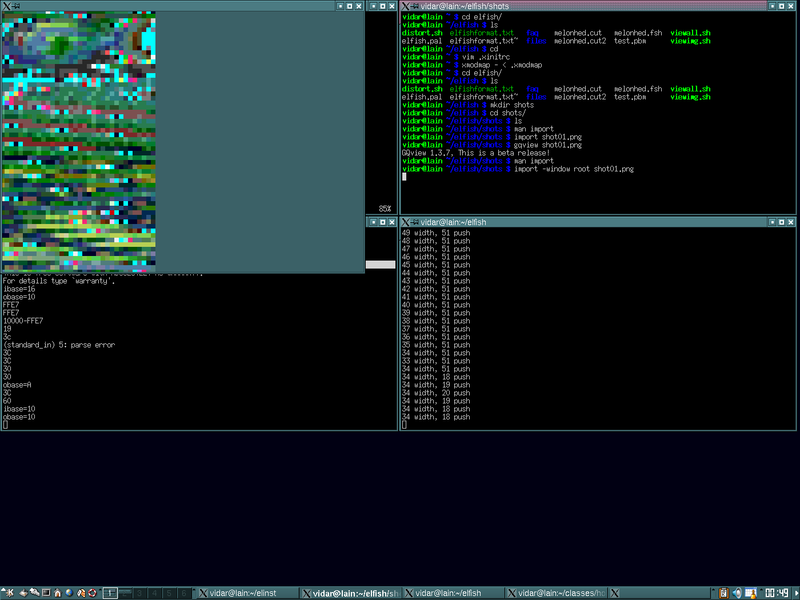 Two years later, after on and off (mostly off, obviously; most of it was done in two days) hacking, I can extract the frames. How much can you do with these specs? I'm currently able to extract animation frames (and description/icon view) but I haven't been able to piece together fluid animations. This same file format is used for .mvy (animations like the crab) and .isb (custom art). Even .aqu (aquariums) and .iso (image libraries) use it to some extent, but I haven't studied it closely. 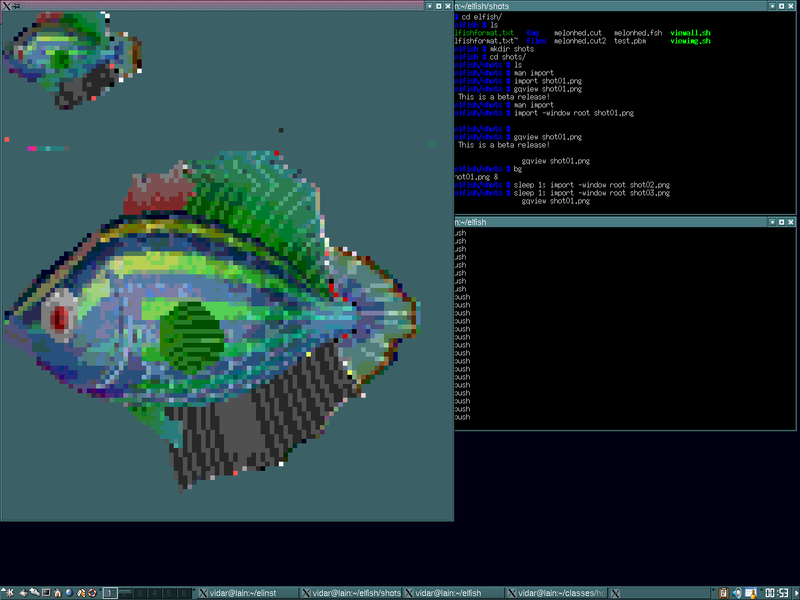 8 bytes   Fish name, zero-padded at end. If the position is positive (two's complement), this is the start of a line. If it's negative, take its absolute value and plot on the current line (the first line only have negative sections). Simply put the pixel data in the line buffer linearly at the specified position. Any part of a line that is not explicitly colored is transparent. 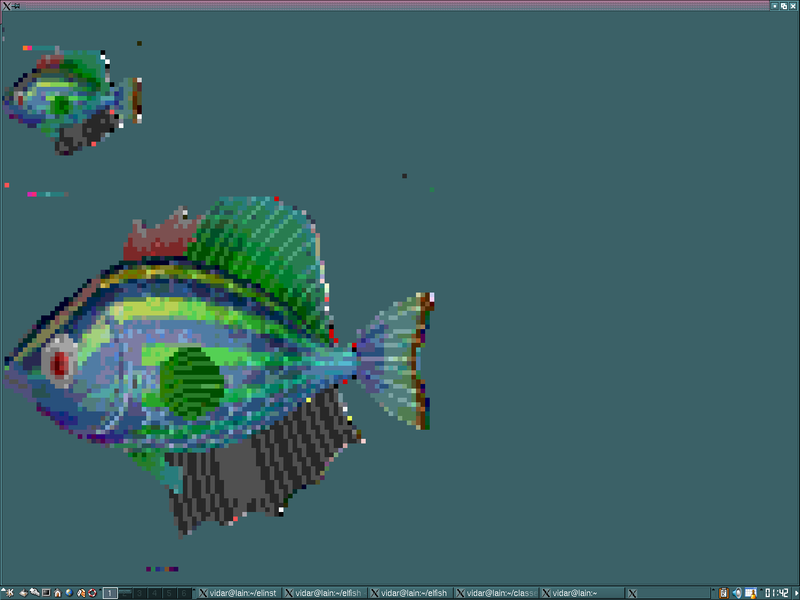 Each pixel is encoded in a fixed palette, which can be extracted from an elfish screenshot or downloaded here. As you can see, there are only left turns. Fish rely on their symmetry for complete animation. Swin animations are done by first playing Swim Right then mirroring Swim Left. The X/Y offsets from the frame header is probably the relative position in which to paint the frame (since each has a varying width and height depending on fin positions and such). Kind of mushed, but alteast linebroken. And here is the game itself: PC Version (thanks to Scootie and the El-Fish, which seems to be down): Disk 1 , 2 , 3 , 4 , 5 . 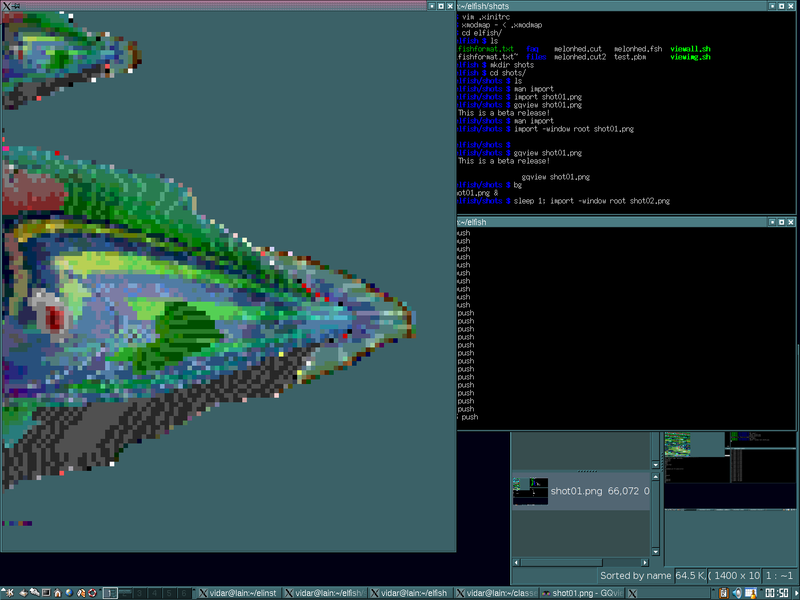 There's also an svga patch to run the game at 640x480.